In Iceland, only one company has a licence to kill fin whales, the second largest animal on Earth. On 19th February 2019, the Minister of Fisheries, Kristjan Thor Juliusson, signed a regulation allowing the hunt of up to 2,130 minke whales and fin whales until the year 2023. IFAW and our Icelandic partners call for an end to this whale hunt. Minke whales are killed mainly to feed tourists in Iceland and fin whales are killed for exportation to Japan. 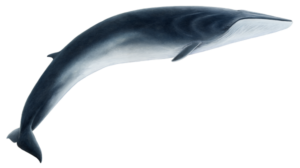 Minke whales are the second smallest species of baleen whale, reaching around eight to nine metres in length. In the northern hemisphere, they have a characteristic white band on each flipper, contrasting with their dark grey top colour. They have around 300 pairs of baleen plates in their upper jaw which act like a strainer as the minke whales feeds on sand eels, krill and fish. Fin whales are the second largest whale species after the blue whale, measuring around 20 metres in length, making them the second largest mammal on the planet. Fin whales are dark grey in colour, with a pale or white underside. The most unusual characteristic of the fin whale is the asymmetrical colouring of the lower jaw, which is white/pale yellow on the right hand side and mottled black on the left. They also stand out not only for their immense size but for their huge blow that can reach up to 9 metres in height. The International Fund for Animal Welfare (IFAW) has been committed to the welfare of whales in Icelandic waters since 1990 when the organisation funded the first feasibility study into the potential for commercial whale watching in Iceland. The idea has always been to create a positive alternative to the cruelty of commercial whaling. Whaling resumed in Iceland in 2003 after a 13-year hiatus. This year, both fin and minke whale hunting are taking place, in part driven by tourist demand for whale meat which is sampled in Icelandic restaurants. Meet Us Don’t Eat Us is a joint project between IFAW and IceWhale, the Icelandic Whale Watching Association that was launched in Reykjavik in the summer of 2011. So far over 500 volunteers from 30 countries have participated in the project which runs mainly through the summer months in Reykjavik. To date, we have collected more than 100,000 signatures from visitors and Icelanders pledging to not eat whale meat, and calling for the cruel and unnecessary whale hunt to end. We regularly deliver these signatures to the Minister of Fisheries to underline international and Icelandic opposition to commercial whaling. We educate visitors on the facts about whale meat consumption in Iceland and encourage them to put down their forks in support of an end to commercial whaling. Tasting whale meat in Reykjavik restaurants is unnecessary, when in reality, this consumption is not that common and whale hunting is not a cultural tradition in Iceland. Icelandic commercial whaling only started after 1935, when new legislation stated only Icelanders could hunt in territorial waters. The industry really only commenced in 1948 with the company Hvalur inc. in Hvalfjordur. Before that time, most of the whaling around Iceland was conducted by Norwegian, U.S.A, Danish, and Basques fleets amongst others. Although this is a serious subject, Meet Us Don’t Eat Us is an uplifting peer-to-peer campaign where we approach visitors and Icelanders in a constructive way, pointing out that the most sustainable way to enjoy whales is through responsible whale watching. By engaging in conversations, distributing informative material, promoting whale friendly restaurants and collecting signatures, our work urges Iceland’s Minister of Fisheries to end commercial whaling and encourage people to support whale watching. The result is that people can see how impactful their choices can be. All minke whales killed in Iceland are harpooned close to the whale watching area in Faxaflói Bay outside Reykjavik. These whales will never be seen again by whale watchers. IceWhale and its members are concerned about this issue and have continued to work closely with IFAW as a consequence. Surveys show that tourist whale meat consumption has been cut in half since our project started, and we aim to reduce this number further. You can help by choosing a whale-friendly restaurant on your visit. When you are around downtown Reykjavik or at the Old Harbour, you will likely see our volunteers in action. Please show interest in their important contribution to whale protection and choose a whale-friendly restaurant when you are in Iceland. Your positive contribution is highly appreciated! Not a tradition and few locals eat it, so why should tourists do so? Since 2004, IFAW has carried out regular polling which shows clear progress in reaching Icelanders with our message that whales are worth more alive than dead. In 2018, only 2% of Icelanders said they had eaten whale meat (Gallup, October 2018) six times or more a year; 84% said they had never eaten it. We have come far in recent years to reach the goal of ending commercial whaling in Iceland. Please join our campaign to protect whales. Thank you!